I was first personally introduced to T-Rex products with the T-Rex Replica delay. That was a delay I was dying to try forever and when I finally got that pedal, I was not disappointed. Amazing delay. Since then, they’ve put out a few other delays (which also has been great), solidifying their ability to create great sounding delays. When the fine folks at T-Rex sent me the T-Rex Replay Box Delay, I knew this was going to be good! First off, like the last set of T-Rex pedals I’ve been talking about (Karma Boost, Quint Machine and Vulture Distortion) the footprint is quite small. To find a delay with these controls and functionality in this size is pretty rare. They definitely figured out how to down size with this pedal. 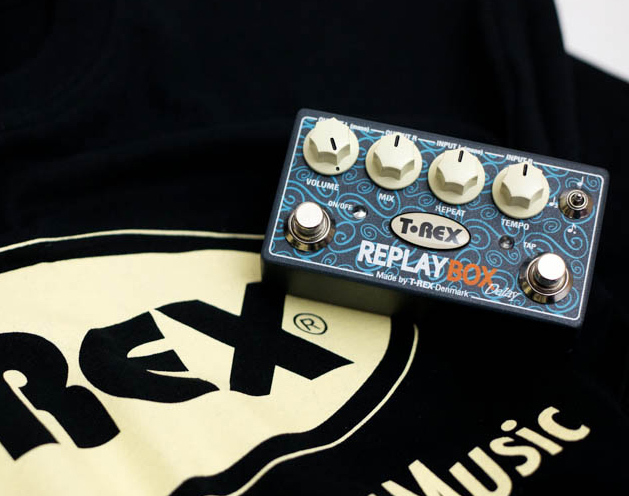 The T-Rex Replay Box has Stereo in/out, Volume, Mix, Repeat, Tempo, Subdivision switch and Tap Tempo! Volume controls the overall volume of the input signal. I left this at 12 o’clock, but also cranked it as well! Mix controls the amount of dry to effected signal. You can mix massive delay saturation or a subtle amount of delay with your signal. Tempo is manual control for delay repeats. Tap Tempo footswitch will override the Tempo control. Finally, there is a standard on/off footswitch to bypass the delay effect. As you can see, there is a lot of control and options for this delay, yet the enclosure is tiny. Very impressed with this fact. Obviously no battery option for this unit, and will only accept 9VDC power. The Subdivision switch is a great option for getting various delays. I personally was into the quarter and triplet settings. I always struggled with the dotted eighth, but that because my brain no-worky when it comes to this. I was very impressed with this pedal. Super quality delay. High level of capabilities and options. And in an incredibly small enclosure for the technology to manage this delay – and with stereo in/outs on top of that. Thumbs WAY up for this guy. Out of the 4 T-Rex pedals I recently checked out, this is by far the best. The T-Rex Replay Box Delay is available at Amazon for only $249, and is absolutely worth every penny. If you’re looking for a delay for your board.. this is a serious contender!